Personalized gift for those wonderful fur babies. Great gift for those of us who believe kids have 4 legs not just 2. 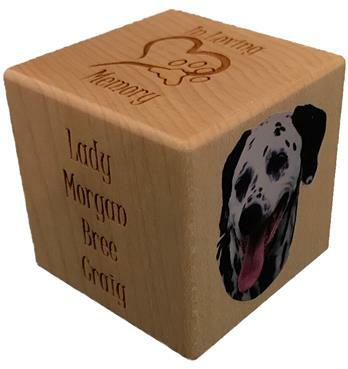 Each block is laser engraved with the details of the fur baby's information. Engraved details include: fur baby's full name, date of birth,date of passing and a special message on side 4. You provide the image for the printed picture by e-mailing a high resolution photo (phones work fine). We will clean it up to a head shot for printing. Appears on bottom of block.